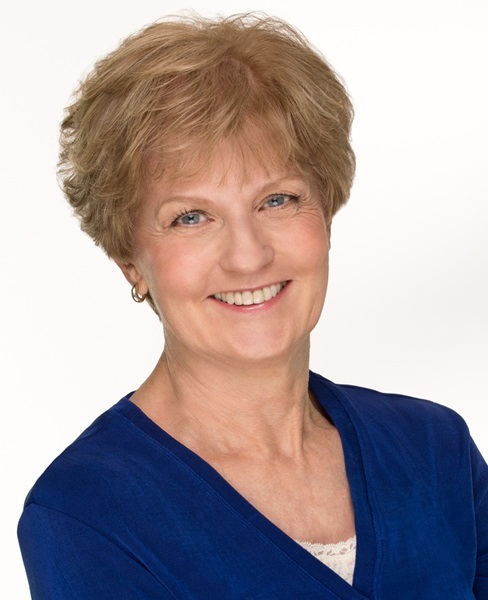 Today we welcome special guest Maya Corrigan--don't forget to read all the way through for instructions on her giveaway! MAYA: Thank you to Lucy and Krista for hosting me on Mystery Lovers’ Kitchen, my favorite site for great recipes and news about the latest mysteries. I’m excited to tell your readers about the fifth book in my series, coming out this week, S’more Murders. My sleuth, Val, can’t pass up a cool catering gig aboard a yacht. Its owner, a collector of Titanic memorabilia, asks her to re-create the final meal served to the first-class passengers on that doomed ship. As if ten courses aren’t enough, the hostess insists on adding a dish that didn’t exist in 1912—s’mores. Thanks to a squall and a killer, no one gets to finish Val's Titanic-inspired dinner, and it's the final meal for one person on the yacht. We know exactly what the passengers ate on the day the Titanic hit an iceberg because a few survivors had souvenir menus tucked in their pockets or purses. No recipes survive from the Titanic's kitchen, but recipes from that era tend to use butter and cream liberally. Val slims down the menu to one dish per course and modifies several courses for vegetarians and calorie-watchers. 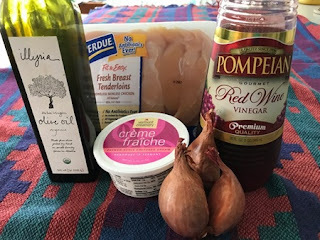 The recipe I’m sharing is a five-ingredient version of the Titanic’s Sauté of Chicken Lyonnaise. 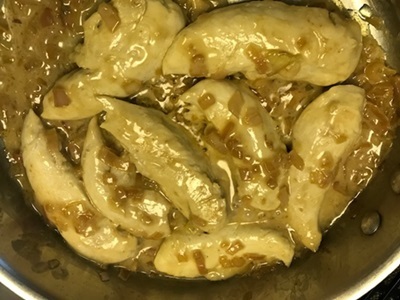 The vinegar and onion sauce in this recipe is popular in Lyons, the gastronomical capital of France, which is renowned for its poultry. Lightly salt and pepper the chicken pieces if desired. Heat the oil (or oil and butter) at medium high in a skillet large enough to hold the chicken in a single layer. Sauté the chicken pieces for 3-4 minutes until lightly brown. Turn the pieces over and sauté them on the other side for 3-4 minutes, until the internal temperature is 165 degrees Fahrenheit. Remove the chicken and loosely cover it with foil. 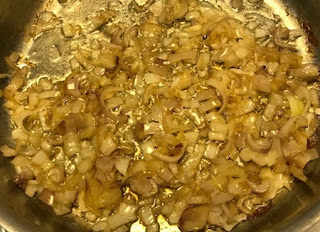 Add the shallots or onions to the pan and sauté them until lightly browned. 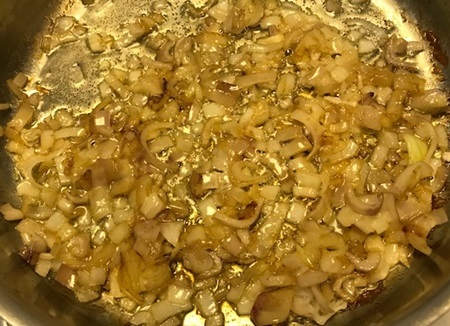 Stir the vinegar into the skillet little by little and boil the liquid down until it’s no longer watery. Stir in the crème fraîche or cream. Cook until the mixture is blended and has turned light brown, about 5 minutes. 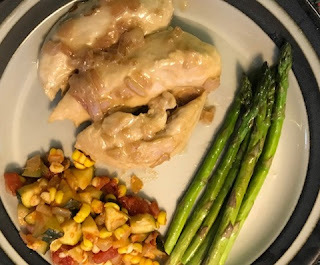 Return the chicken to the pan and heat the pieces in the sauce, rotating them to make sure all sides are in the sauce. 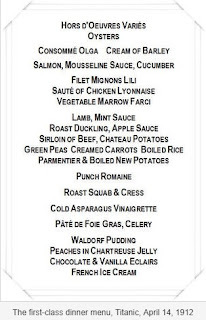 Would you go to a dinner that re-creates the last meal on the Titanic without any qualms? Or would you be leery of tempting fate or reluctant to celebrate a tragic event? Leave a comment for a chance to win a copy of S’more Murders. A U.S. winner will receive a signed paperback. An international winner will get an e-book for a Kindle or Nook. Good luck! 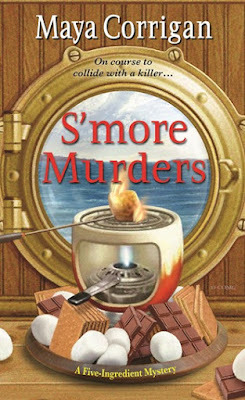 Maya (Mary Ann) Corrigan lives in Virginia, an easy drive from Maryland’s Eastern Shore, the setting for her Five-Ingredient Mysteries: By Cook or by Crook, Scam Chowder, Final Fondue, The Tell-Tale Tarte, and S’more Murders. The series features café manager Val Deniston, who solves murders with her live-wire grandfather in a historic Chesapeake Bay town. Each book has five suspects, five clues, and Granddad's five-ingredient recipes. Visit Maya’s website, mayacorrigan.com, for easy recipes and trivia about classic mysteries. She loves hearing from readers. Visit Maya at her website or on Facebook. I would chance it :) This sounds like a fun read. Thanks for your comment, MamaHen. To research my book, I put on a Titanic re-creation dinner party, and it was great fun. Good luck in the raffle. Thank you for you comment. Everyone who came to my Titanic re-creation dinner party had a great time, and we walked away from it. Thank you for your comment. My Titanic re-creation dinner party was a night to remember and lots of fun. I think the only problem that would come from that dinner would be from eating that many calories. Hi Sandy, Thank you for your comment. You are so right about the calories in that dinner. Good luck in the raffle. 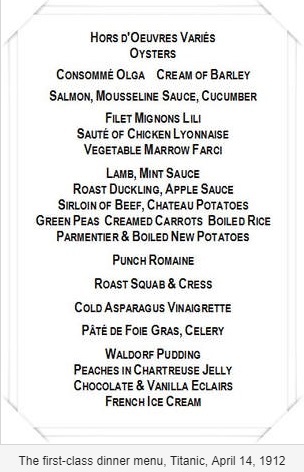 I think it would be interesting to have the meal served on the titanic. Hi Judy, Thank you for commenting. Good luck in the raffle. Will have to try this recipe. The chicken sounds delicious. I wouldn't have a problem with the menu, although it does seem a bit on the rich side. Can't wait to get this one so I can try the recipes. Thank you Maya Corrigan! Thank you for commenting, Meg. Good luck in the raffle.